Mellon funds Phase III of Cultures of Knowledge! We are delighted to announce the award to Cultures of Knowledge of a third round of funding from the Andrew W. Mellon Foundation. This grant of $744,000 will take Early Modern Letters Online [EMLO] through another two years of development, from April 2015 to March 2017. We are deeply grateful to the Foundation — and to all our partners, contributors, and team members — for their invaluable support and continued confidence in the significance of this rapidly growing project. The CofK Phase I website, with our seven founding catalogues. From its inception in 2009, Cultures of Knowledge [CofK] has evolved continuously. During Phase I (2009–12), the aim of creating the nucleus of a union catalogue moved from the periphery to the centre of the project. During Phase II (2013–14), the aspirations for EMLO evolved from creating a finding-aid to devising a suite of digital tools for collecting, standardizing, merging, publishing, navigating, analysing, and visualizing unprecedented quantities of epistolary metadata. The core objective of Phase III (2015–17) is to complete the evolution of EMLO from a resource designed, built, and populated in Oxford to one designed, built, and populated collaboratively. 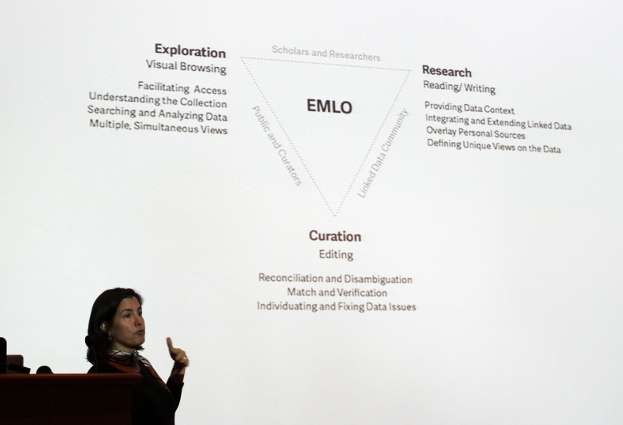 Nicole Coleman from Stanford’s Humanities+Design describes EMLO at the COST Action Digital Humanities Conference in March 2015. The ultimate aspiration of the project is now to create a platform for radically multilateral scholarly collaboration — a ‘scholarly social machine’ — which can furnish an entire community of scholars and repositories with the means of piecing back together the millions of scholarly letters scattered across and beyond a continent during the early modern period. Once developed for such a purpose, this technology can be applied to earlier and later periods, and to the documentation of other forms of learned exchange, while the workflows and cultures created can be repurposed to bring other communities of expertise to bear on analogous problems. 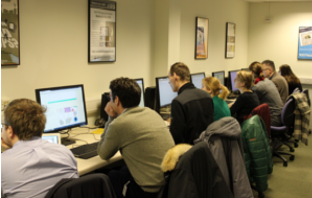 Working hard at the Digital Humanities Training School, 22-25 March 2015, co-organised by COST Action IS1310, CofK, and Huygens ING. In pursuing these ambitious goals, the further development of EMLO will be informed by discussions coordinated by the new COST-funded, pan-European network, ‘Reassembling the Republic of Letters, 1500–1800’, chaired by CofK’s Director, Professor Howard Hotson, from April 2014 to April 2018. Together, CofK and the COST network are designed to produce a community designed, user-tested blueprint for a transformative piece of transnational digital infrastructure capable of harvesting and analysing data on an unparalleled scale, which will form the core of the further large-scale applications needed to fund its full development. CofK’s agenda in Phase III is built around four core activities. Objective: to continue expanding EMLO’s community of contributors and user-testers. Partners: EMLO Digital Fellows and interns, scholarly contributors, collaborative projects, publishers, and repositories. Objective: to increase the efficiency of editing, matching, and merging new data from all sources through semi-automation of mechanical aspects of workflows, thereby preparing for high-volume contributions and uploads. Components: publishing EMLO as controlled-access Linked Data; semi-automating the standardization and matching of records in data entry, in existing datasets, and within existing EMLO data to enhance records and resolve any data fusion problems. Partners: in Phase III we will be working closely with the Oxford e-Research Centre while continuing our long-standing partnership with the Bodleian. Much of the key systems development will be undertaken by Eetu Mäkelä, a post-doc based at Aalto University’s Semantic Computing Research Group, which is also closely involved in the COST Action. Objectives: to integrate existing means of visualizing epistolary metadata, to develop new means of visualizing prosopographical metadata, and to explore use of visualization for interrogating and searching all data on EMLO. Partners: Nicole Coleman and the team at the Humanities+Design lab in Stanford. Components: integrating components of Stanford’s second-generation visualisation tool, Palladio, into EMLO’s user interface for visualizing epistolary metadata; enhance the prosopographical element begun in Phase II and explore cutting-edge visualizations of this complex data. Objectives: to experiment with means of engaging both a local and an increasingly dispersed contributor community through Mellon-funded outreach events, and participating as required in COST-funded travel, training schools, and conferences. Components: Online exhibitions and outreach; local community engagement; EMLO user engagement. Partners: contributors providing material and resources for the creation of digital exhibitions. Here at CofK HQ we are hugely excited about everything in store for 2015. To keep up to date with the latest news you can follow us on Twitter (@cofktweets) and sign up to our mailing list. If you have metadata on early modern letters that you would like to publish on EMLO, please get in touch with us for an informal chat. Learn more about us on the CofK, EMLO and COST websites. This entry was posted in Project Updates on April 20, 2015 by Miranda Lewis.